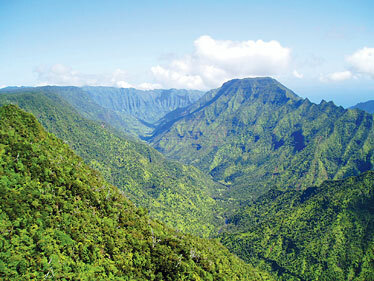 Wainiha Valley on Kauai is one of the primary areas that the Nature Conservancy's weed-tracking project will focus on. A camera system that can map thousands of acres by airplane with images so detailed that tree leaves can be identified is expected to revolutionize conservation work in Hawaii and around the world. Dana Slaymaker of Resource Mapping Hawaii developed the technology for the Nature Conservancy, which is testing it on 80,000 acres of forested land on Kauai that the Conservancy oversees. 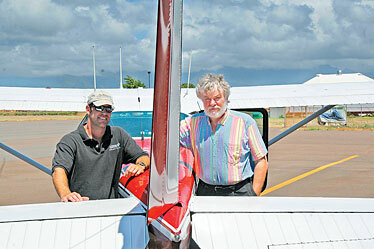 Pilot Jimmy Ray Hoffert is using three specialized cameras in his Cessna 182 single-engine plane. One is a multispectral high-definition digital video camera that collects images in green, red and infrared wavelengths. The other two cameras are extremely high-definition digital models with 210 mm lenses, which shoot in natural color. 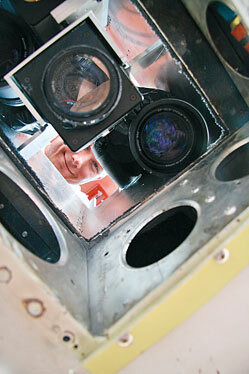 Pilot Jimmy Hoffert peers through the digital cameras installed in the underbelly of his plane. The two natural-color cameras each have 33-megapixel sensors and the high-definition multispectral camera has about 12 megapixels, Slaymaker said. The big natural-color cameras fire once every 1.5 seconds, providing a continuous swath that's 12,000 pixels wide, he said. Each pixel covers 2.2 centimeters square - less than an inch - so different kinds of ferns and invasive species can be identified by leaf structure, he said. A three-dimensional capability allows scientists to calculate heights of individual plants. "The basic idea is you can't control what you can't find, so the better your tools for finding invasive plants in extremely remote terrain, the better your chances of controlling them," said Suzanne Case, executive director of the Conservancy in Hawaii. Many forests have no trails and are inaccessible from the ground, she said, explaining the Conservancy has done helicopter surveys "which are expensive and frankly dangerous." Now they can make detailed photographic records and search for specific plants, she said. "It's a complete revolution in the way we can do aerial mapping of weeds," Case said. Hawaii has about 5,000 non-native species and about 500 are invasive, she said. "Probably 50 are on everybody's top list of weeds that are so dangerous to our natural area," she said. "If uncontrolled, they'll completely transform native forests to non-native forests and, in the process, lose ability to capture water for our watersheds. ... And all of our species found nowhere else in the world." Slaymaker, of Massachusetts, said he designed the camera system specifically for conservation purposes, using small portable multispectral and natural-color digital cameras that can be attached to any Cessna aircraft. He has worked here a few years with the U.S. Geological Survey and Nature Conservancy and last year, the conservancy asked him to develop a camera system for permanent use in Hawaii by conservationists, he said. The Nature Conservancy allocated $400,000 in private, state and federal money for the pilot project on Kauai, Slaymaker said. Nature Conservancy Kauai program director Trae Menard, left, is pictured with designer Dana Slaymaker of Resource Mapping Hawaii, who developed the technology for the Conservancy. Trae Menard, the conservancy's Kauai program manager, said the initial target is the Australian tree fern on Kauai, a highly invasive and fast-growing weed that is displacing the native forest. Results are preliminary from recent flights in the upper Wainiha Valley and Alakai Plateau, Menard said, but the Australian tree fern is easy to spot and map and they might be able to pick out other weeds as well. "Overall, it's very impressive," Menard said.